As a recent graduate with a master’s in political science and a graduate certificate in nonprofit management, finding a job has not been easy. I prefer to blame the economy. Overall unemployment declined in June 2015, but the public sector has not seen such favorable growth. My unpaid internship left me with no job offer and a litany of tangible skills employers overlook because the position was “just an internship.” I began to wonder is it because I am a millennial? Millennials are known as the “me” generation and the selfie generation. We are often painted as narcissistic and lazy. At best, we are characterized as young and still learning how to fit in to the workplace. At worst, we are characterized as disinterested and entitled. Being portrayed as lazy is particularly frustrating when one considers that millennials are the most educated generation in history, and we currently surpass Generation X’ers in the workforce. In fact, rather than spending the last few days in graduate school binge watching Netflix (or whatever it is people think millennials do), I like many of my peers celebrated with countless hours of writing and rewriting cover letters and finding that perfect resume layout. For my first monthly column, I want to make the case for hiring a millennial – especially in the public or nonprofit sector. In true millennial fashion, here are the top five reasons to hire us! 1. We are digital natives. You believe you have found the dream job. The agency or nonprofit seems to have a mission that truly resonates with you. While the salary is lower than you hoped, you convince yourself that you will make the student loan payments work. You begin to look through the qualifications, bachelor’s degree required, MPA or related degree preferred – check. Experience in social media platforms – check. Proficient in Microsoft Office and Excel – check. Then there it is, in bold print mocking you: five to seven years’ experience. Millennials are often overeducated and under experienced. But, one thing we do have is our technological aptitude. Unlike previous generations, we grew up with technology. Our understanding and use of technology is one of our biggest assets. Given the chance, we have the potential to use our technological prowess in innovative ways to promote transparency and accountability in public administration. 2. We are more likely to stay at our first job for longer. It is true that this may be due to the overall job market not affording us the opportunity to switch from job to job, but that does not mean it is entirely bad. For the millennial, this often means more on the job training and job security. For the employer, reduced turnover rate may lead to increased productivity. 3. We are concerned with equity and social justice. One of the biggest complaints millennials had with the Affordable Care Act is that it did not go far enough. In fact, many millennials believe the government should have a more active role in addressing societal problems. Instead of rallying on the National Mall in protest, millennials often incorporate social activism into our daily lives by going green, and buying products that support a cause (think Toms Shoes and Warby Parker). Our commitment to equity makes us uniquely qualified to be leaders in the public and nonprofit sector. 4. We are diverse. With 43 percent of millennials being nonwhite, we are one of the most racially diverse generations. In fact, by 2043, the U.S. Census Bureau predicts that the United States will no longer be a majority white country. Although we may not be as religious as the previous generation, we grew up in religious homes and have been exposed to a variety of religious traditions thanks to immigration. Unlike our parents, we were more likely to have grown up in non-nuclear families, which, makes us more accepting of nontraditional family structures. Given that public administrators and those involved in the public and nonprofit sector must work for the common good, we have no choice but to ensure that our practices are culturally competent in nature. As such, the Network of Schools of Public Policy, Affairs and Administration (NASPAA) have required that accredited MPA programs prepare students to “communicate and interact productively with a diverse and changing workforce and citizenry.” As a diverse cohort, we bring real life experiences to the classroom and the job market. 5. We are resilient. Despite an economic recession, massive student loan debt, not knowing if we will ever be able to afford to buy a house, and the head-banging frustration that comes from the catch-22 of needing experience to get a job, but no job giving you an opportunity to gain that experience, we remain optimistic. And we should remain optimistic! It may very well be the narcissistic millennial talking, but our generation has the potential to work with diverse populations, promote equity and utilize technology to develop new, innovative ways to address the challenges in our society. 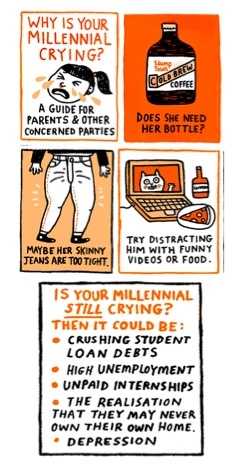 So next time someone calls you a millennial, thank them and hand over your resume. As stated, a well written article. However, with the exception of diversity, the same can be said for previous generations. This is a well-written article. I hope it will go a long way to understanding millenials, who are the future of our Society (ASPA) and the public service profession.